So great visiting with the grandkids. 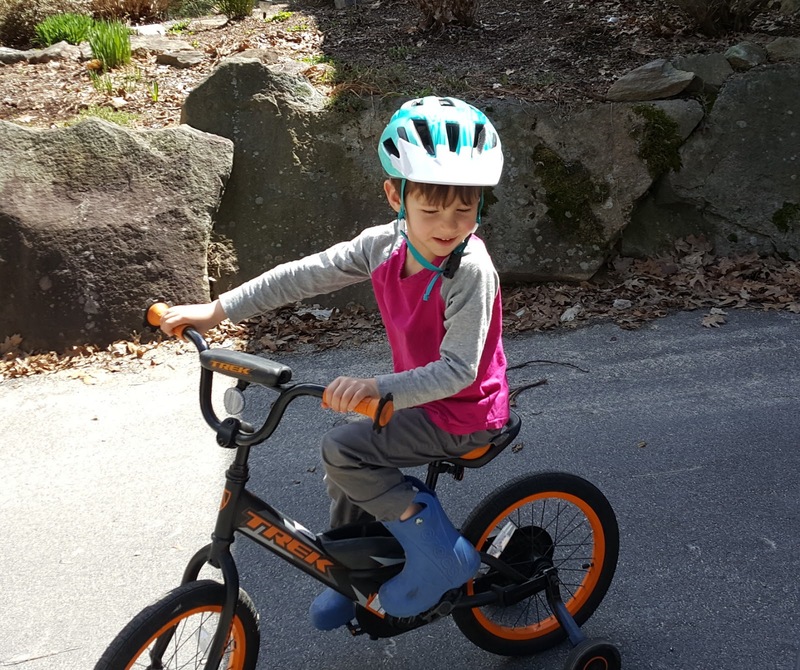 Lucas is really going to enjoy his bike this summer! 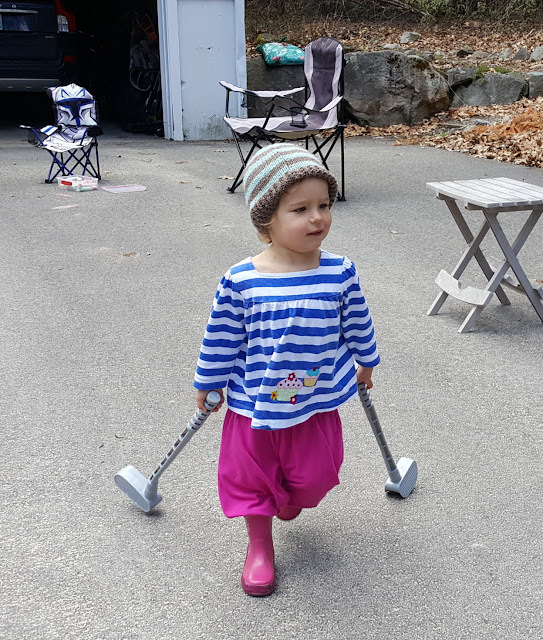 LPGA golf approach while balancing on one leg. Do you remember great times with your cousins? 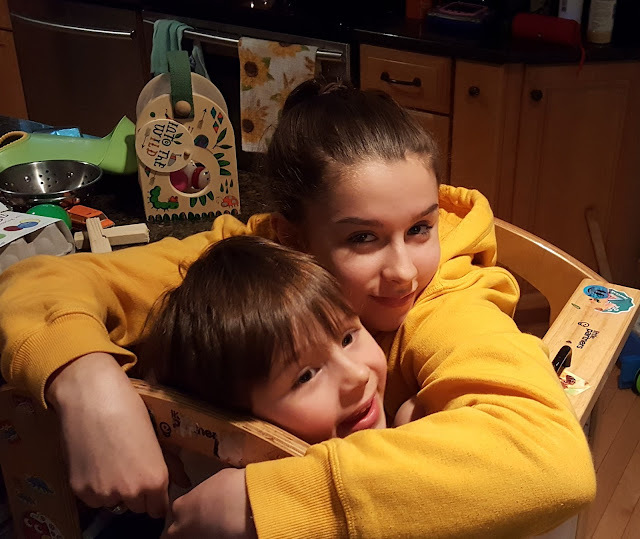 Madison and Lucas always seem to enjoy the time together. Full disclosure. We visited with a number of family and friends already. And we got so involved in visiting that we never took out our camera. So be forewarned , we will probably take too many pics at the next get together. can escape the dreadful camera. 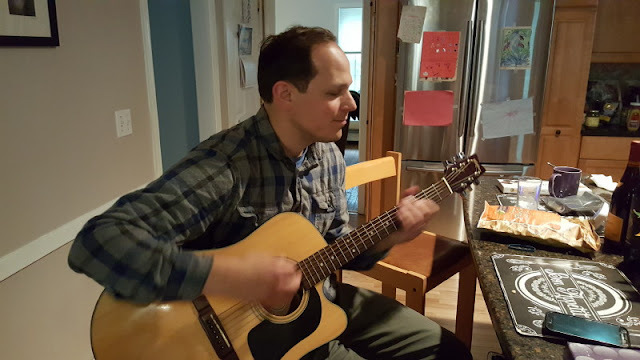 Good to hear Scott having a little fun on the guitar. "Ring around the _ _ _ _." 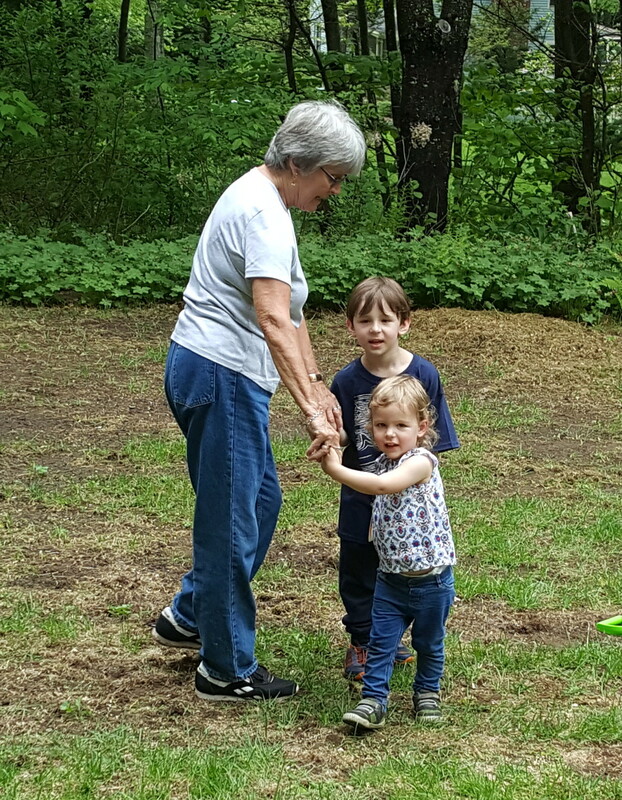 Back at one of our favorites--Walnut Grove Campground. Just in time for the daffodils. 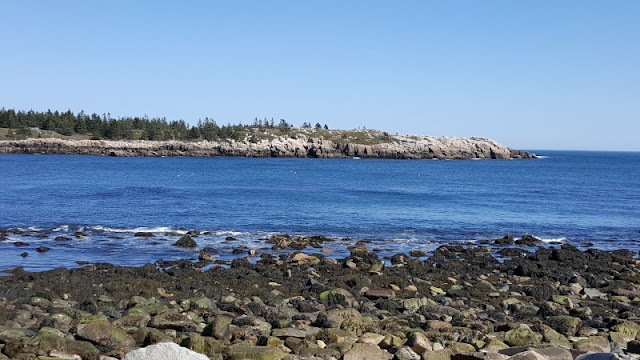 Actually found a campground in Kennebunkport, Maine that was right on the route for the Maine Coast Marathon. 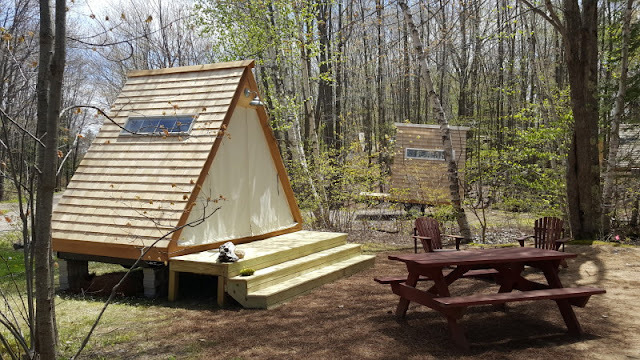 This campground has recently changed hands and has been completely renovated, infrastructure and all. Love the 60's Shasta style trailer and a Corvair wagon. 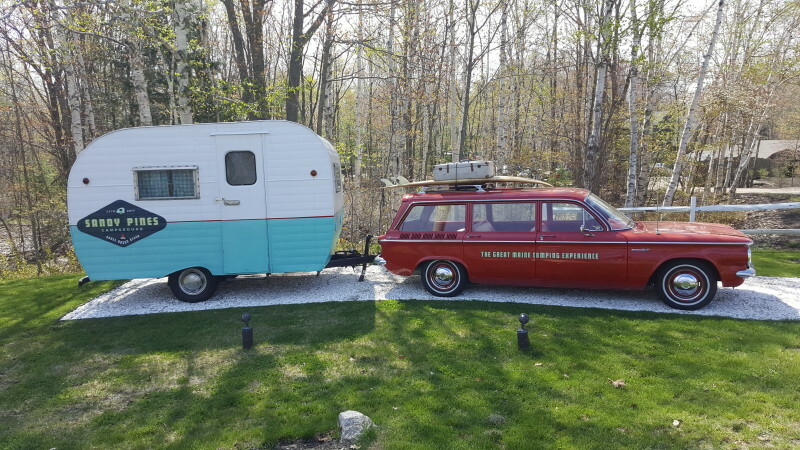 This campground is into Glamping which we understand to be Glamour Camping. The A frame above is just a simple shelter for 2 people . Looks quite comfortable though. The Glampng tents are huge with modern furniture , electricity, and more. We previewed the 26.2 miles of marathon route. Sean had plenty of energy as he passed us at the campground entrance at mile 18. 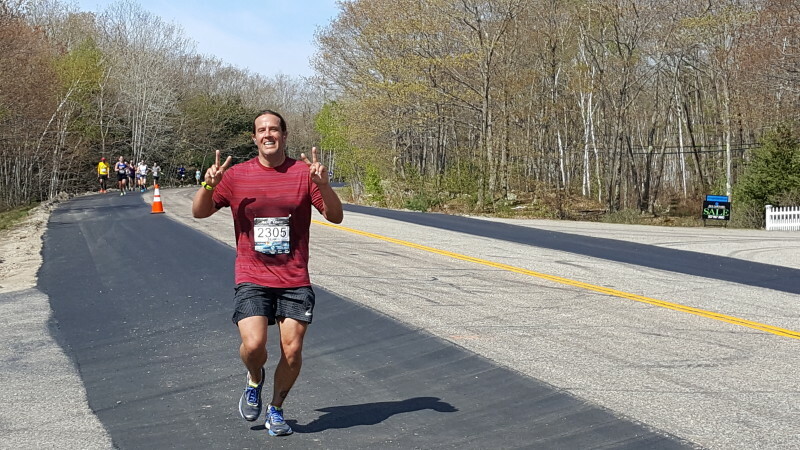 Two weeks later he actually completed the 50 mile ultra run at Pineland Farms in Gloucester, Maine. Still can't wrap our heads around 50 miles of running--at once. In case you are wondering-over 10 hours total. Had a chance to catch lunch with Sean in between Madison's dances at her Dance Competition. 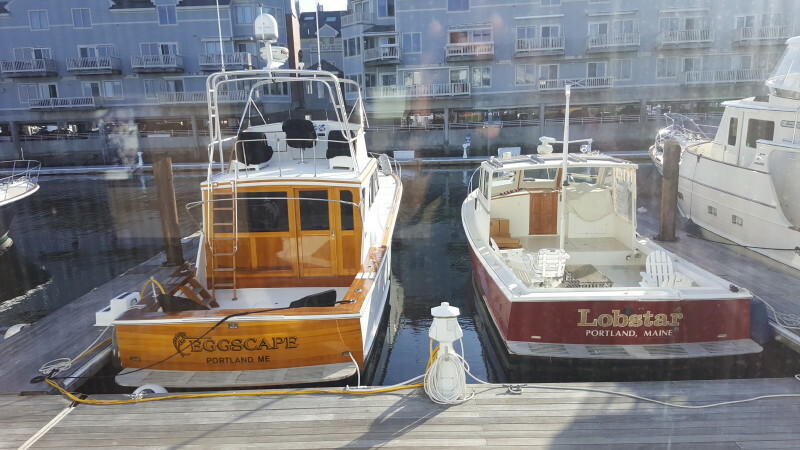 Always wonder what reasons are behind boat names. The lunch was at DiMillo's on the Water-the big boat in the background. Nice views from the windows. A picture from Madison's solo competition. Her routine also included a well executed back flip. Really enjoyed all of the dances at the competition. 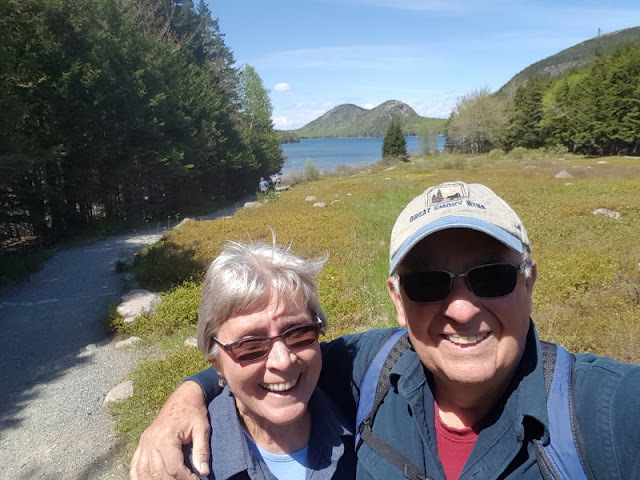 Jan and I have not been in New England for Spring in quite a while. Love seeing all the flowers. 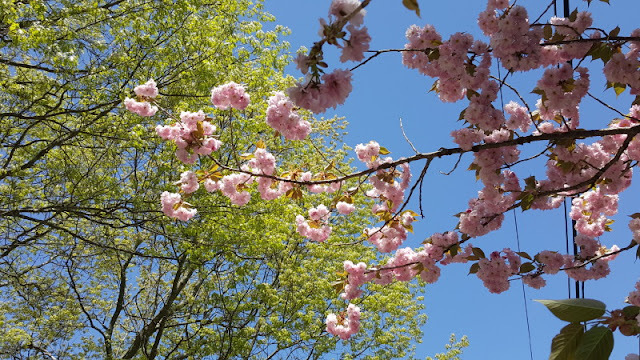 Especially treated to some wonderful flowering trees like the above and also many varieties of lilacs. A sadder occasion recently was the memorial service for Jan's uncle. As many of you will note, sometimes the passing of the older generation can produce a meeting of relatives who have not gathered in decades. Such was this case. And one of the results were these pictures from the past. 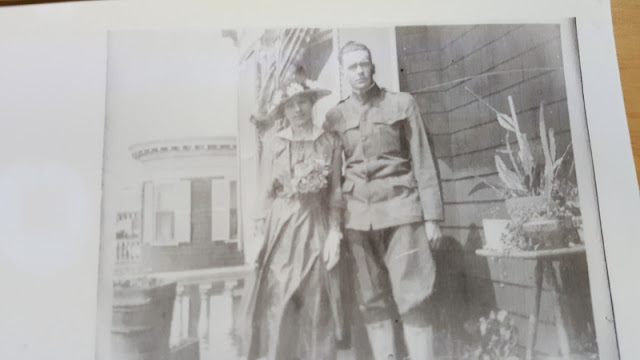 Above is a picture of Jan's Grnadmother and Grandfather on their wedding day `on May 25, 1918--100 years ago! 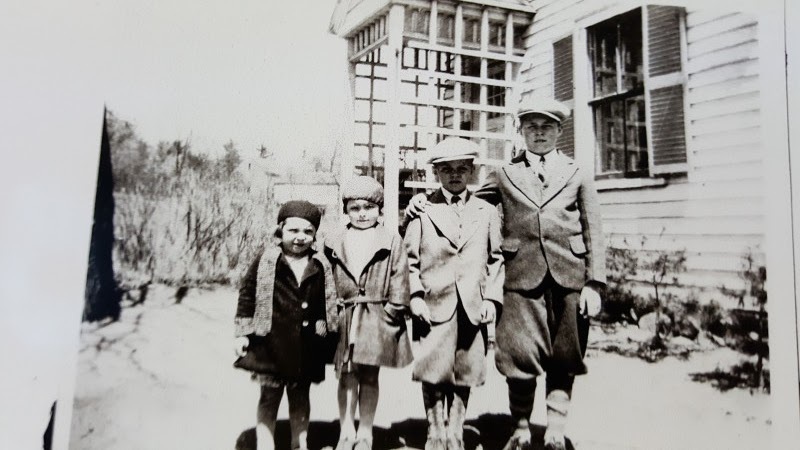 Also included was this pictures of Jan's dad and three siblings in 1933 when he was 13. Uncle John, whose memorial we attended, is too young at this time for this picture. We decided to give our bikes a tune-up and look for some trails in Maine. 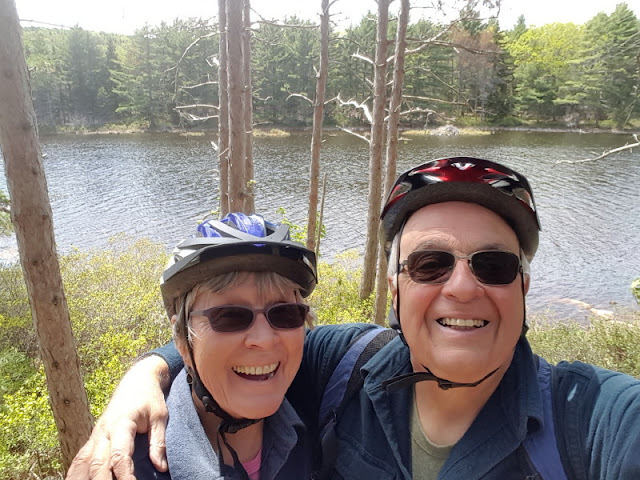 Found some great ideas through the bike place , Maine Bikeworks of Saco, Maine. 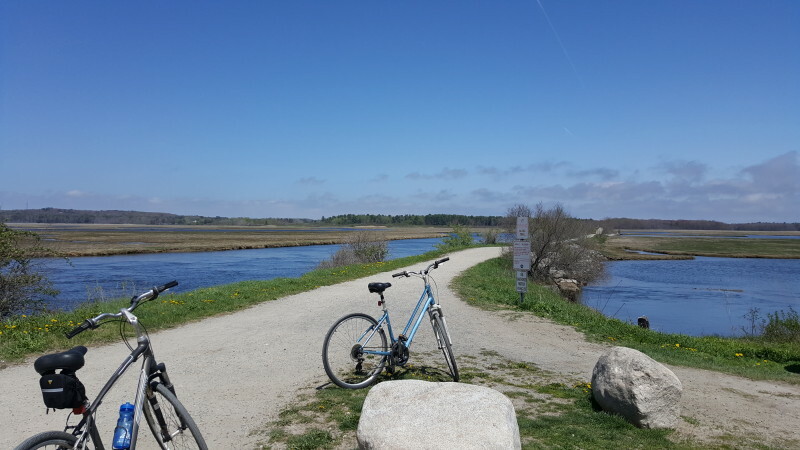 They sent us to some great access points for the Eastern Bike Trail, where we could also safely park Lady Blue. The above is a nice segment that heads across marshland. 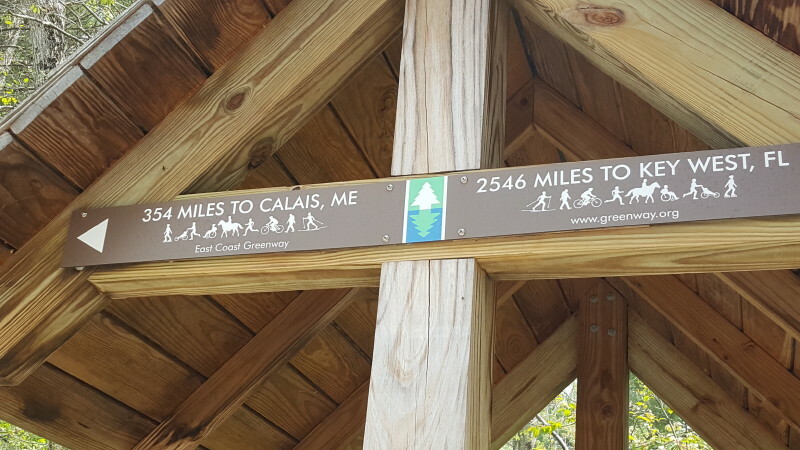 The trail heads all the way from Calais ,Maine to Key West, Florida. 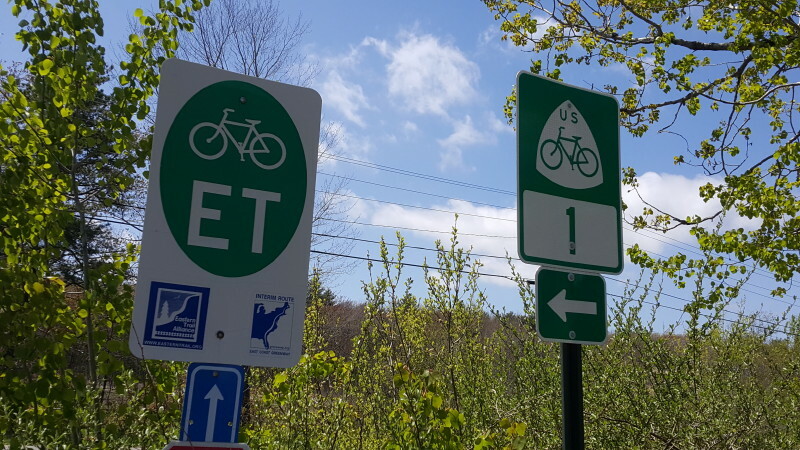 Note: East Coast Greenway. 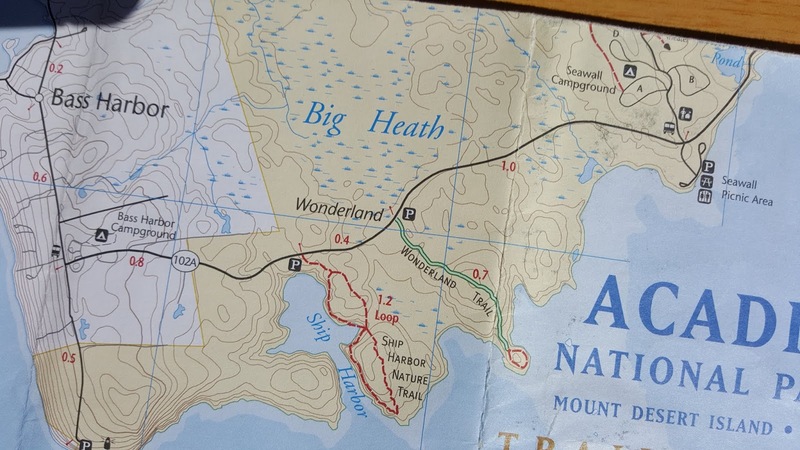 You may note that we are not giving a lot of route directions on this blog segment. 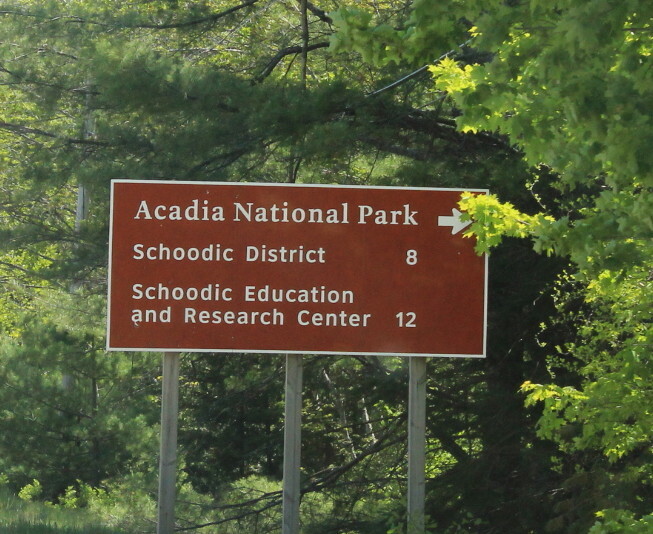 Basically , we are heading up Route 1 to Acadia National Park. 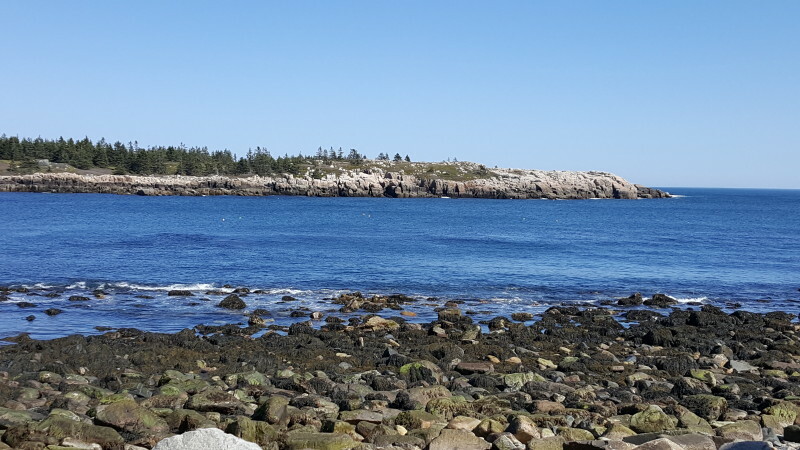 This stop, however, is in Camden, Maine. 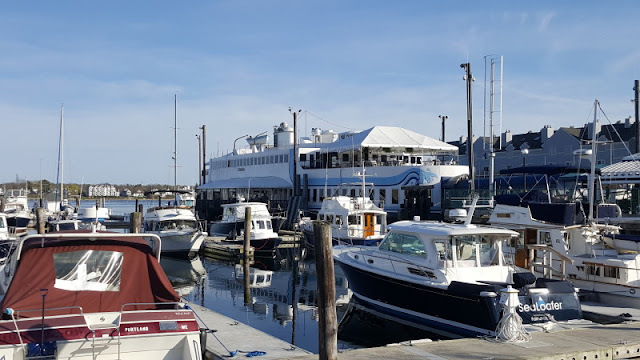 A beautiful , seacoast town. 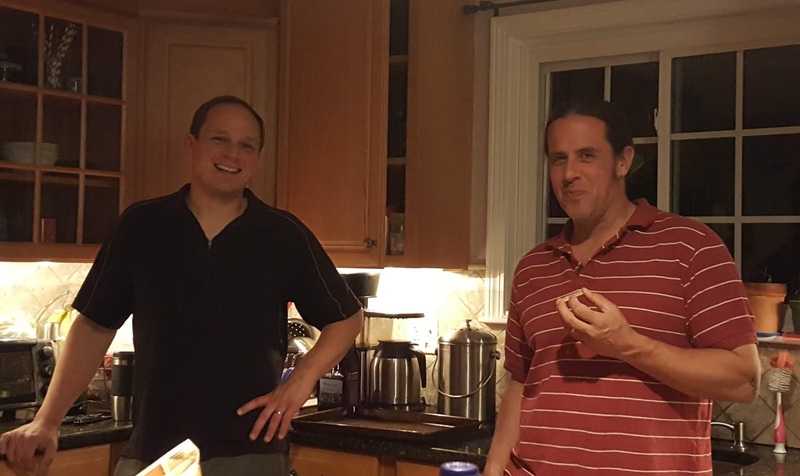 Also a chance to spend some time with friends Dave and Nancy. This is from our site at Camden Hills State Park. Across the street at the Day Use area, they had a great idea of placing a few Adirondack chairs(thankfully chained down). If we were staying longer, we would definitely bring coffee over one morning. 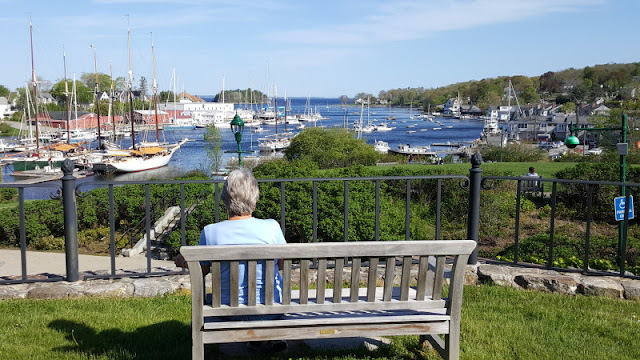 Jan enjoys the view from the Public Library , which just happens to be on the hill overlooking the harbor. The sailboats on the left are used for daytime and sunset cruises. 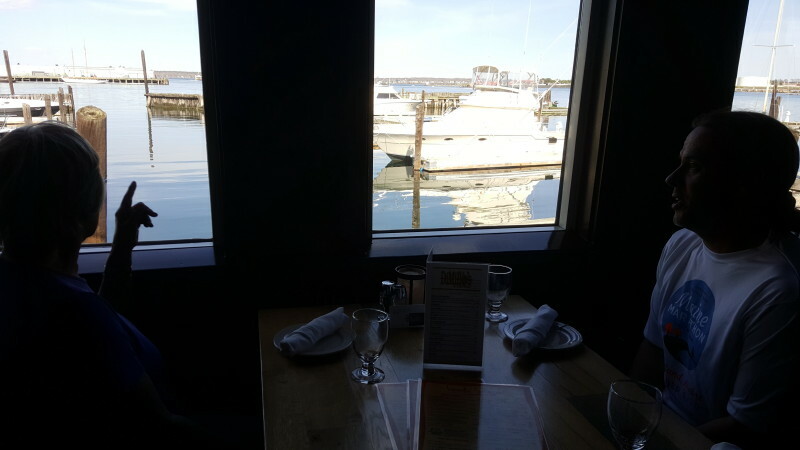 Dave and Nancy were great at picking two restaurants-one for each night- on the harbor in Camden. Check out their menus below. 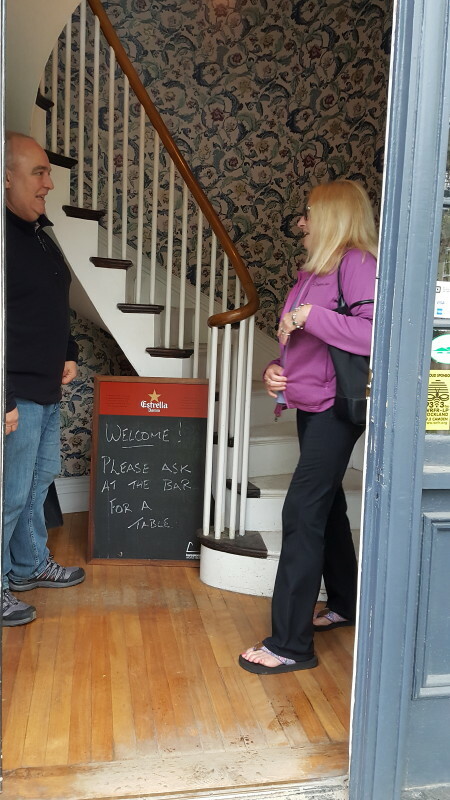 While friends, Dave and Nancy, were checking on good restaurants for Camden they just happened on this example of a staircase that caught Dave's eye. Staircases are Dave's expertise. 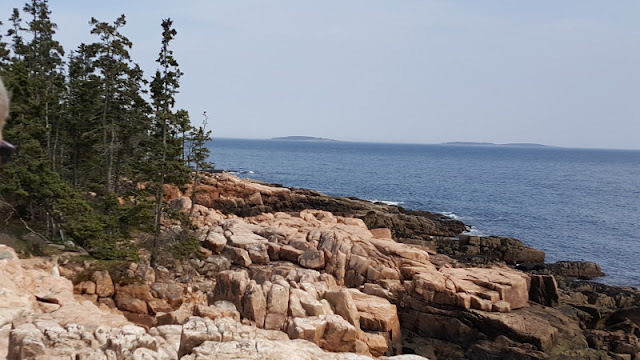 Acadia National Park is one of our favorite parks. 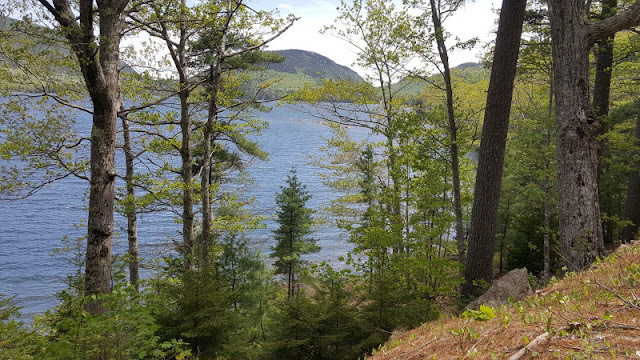 This time we took a chance on finding a campsite for Memorial Day weekend. Foolish--we know. 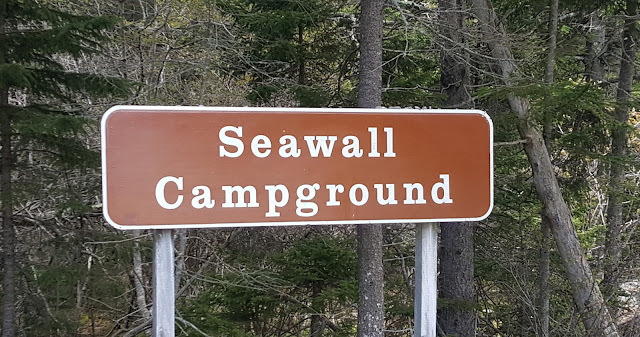 We did , however, find a great site for 3 nights at Seawall National Park Campground. Dry camping, but a very comfortable site. 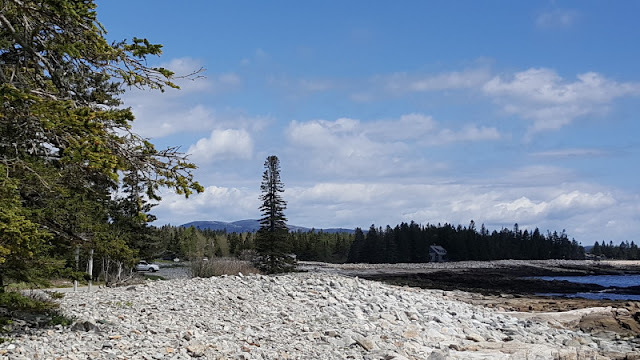 Seawall is on what is called the quiet side---the western side of Mount Desert Island near Southwest Harbor. Above you can get a little of the reason for the name Seawall. 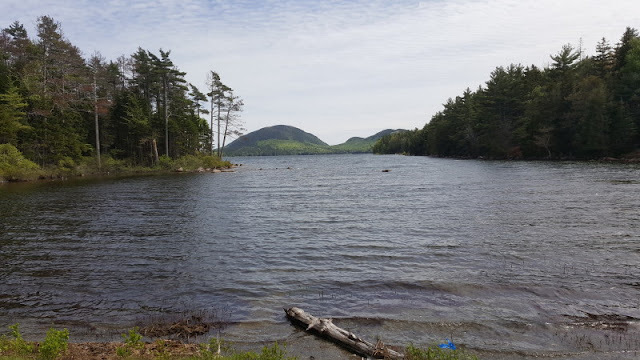 Being a quiet day--Thursday--we know we can get a parking spot at Jordan Pond. That allows us to take a great 3.5 mile hike around the lake and then enjoy their famous Popovers, jam, and coffee. 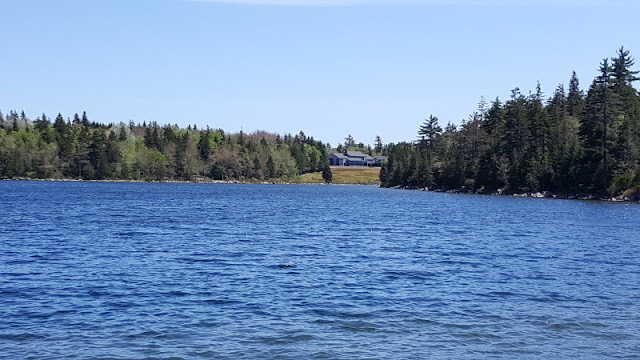 A look back at the Jordan Pond House from our hike. Thought Bailey would enjoy the bog walk work . 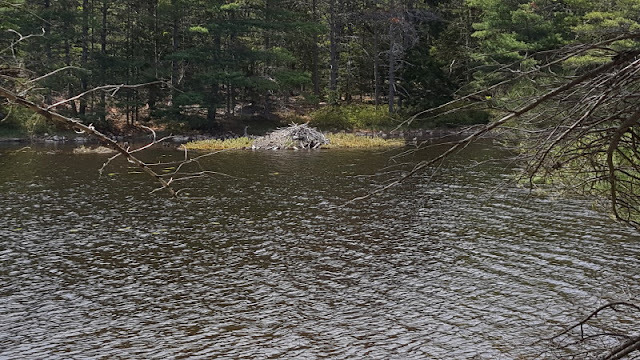 The raised boardwalk goes quite a ways around this side of the pond. 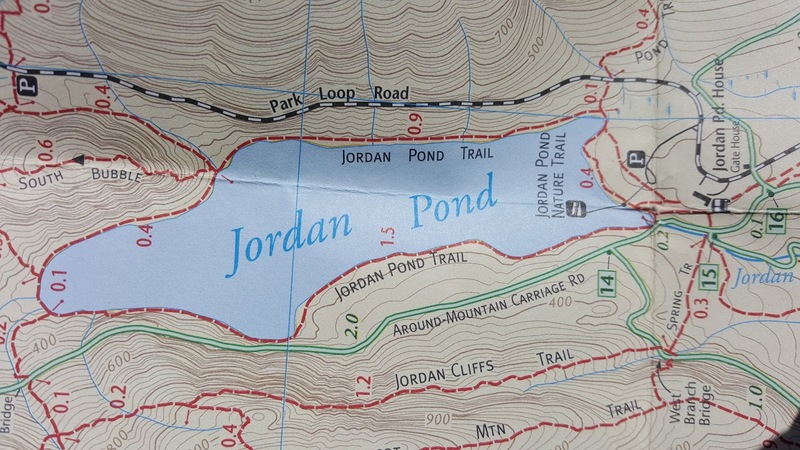 As you can see, the Jordan Pond Trail also links up with a number of other trails and the carriage roads as well. 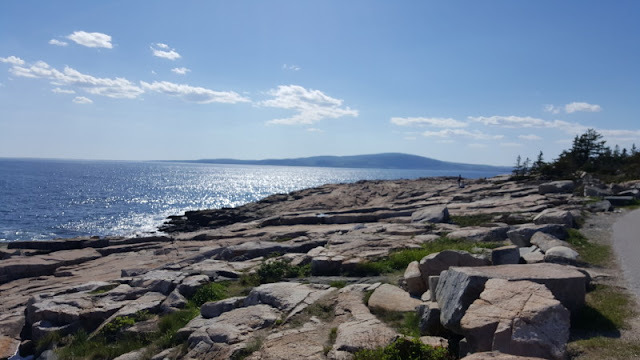 Near our campground, Seawall, are a number of other short hikes that offer great views. This is from the Wonder Land Trail. 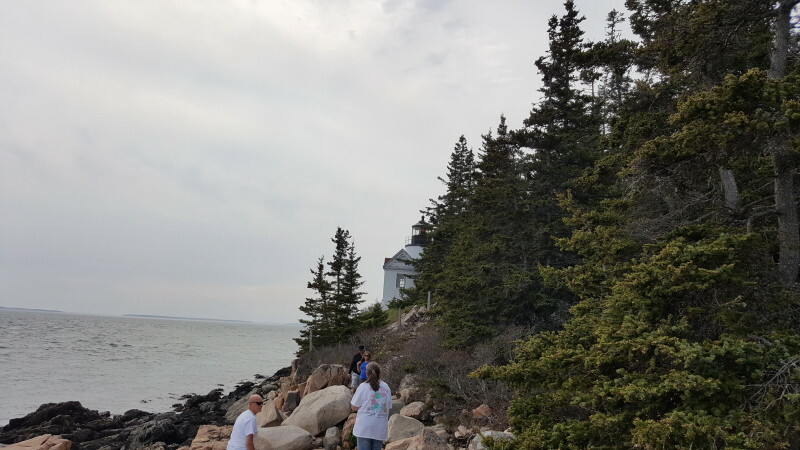 The next stop is the Ship Harbor Nature Trail. 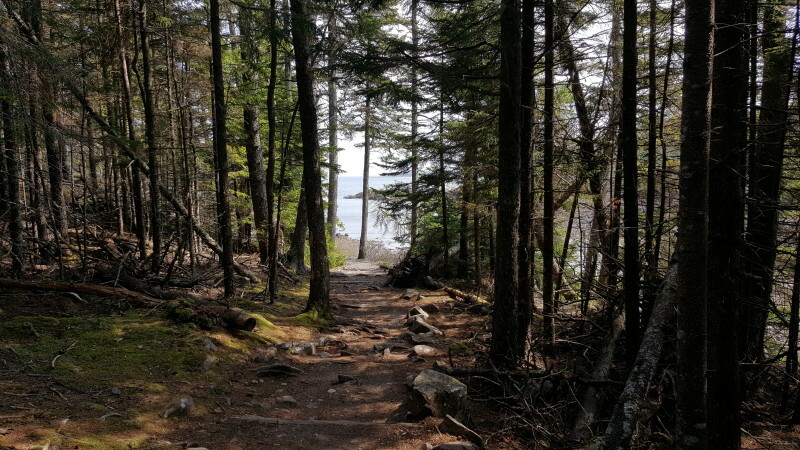 Lots of views from the dense woods. The bottom left of the map would have shown the road down to the Bass Harbor Head Lighthouse. 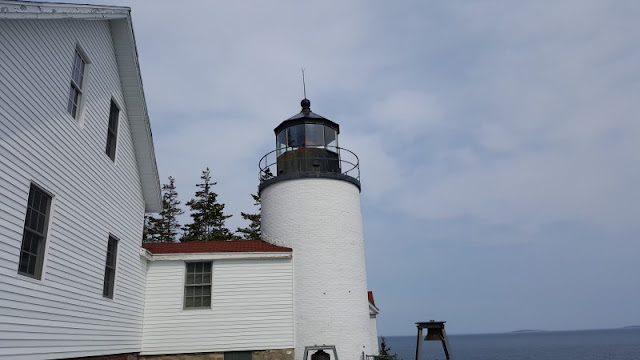 One of the most visited lighthouses in Maine. 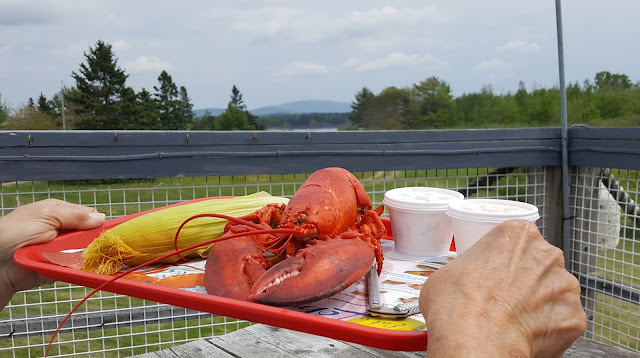 Of course all that exercise requires a good Maine coast meal. How about a freshly steamed lobster with a view of Cadillac Mountain. Did we mention that we did not have reservations for memorial Day weekend? So, come Saturday, there was no room at Seawall. But we headed to one of our favorite private campgrounds, Bar Harbor Campground. 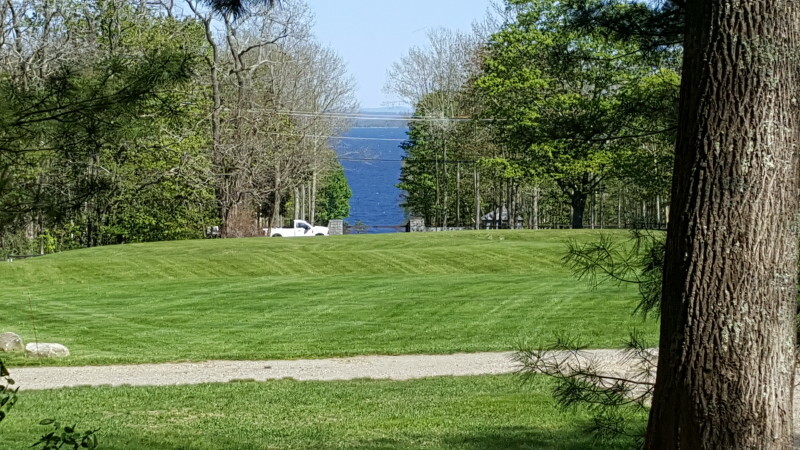 This is our site--not too bad, with a view of Frenchman Bay. 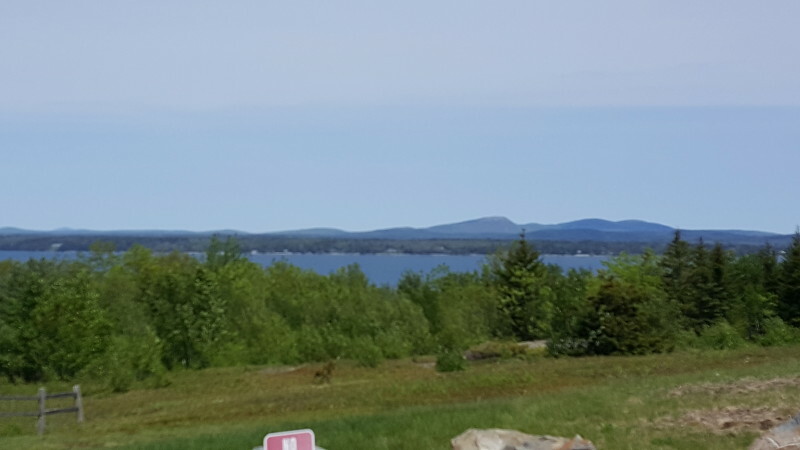 The thing about Bar Harbor Camp is that 1--they do not take reservations--great! And also, they do not take credit cards. Just cash or check. That works great for us and yes, there were a large number of open sites to choose from. By the way, the above site, we were able to take on Monday after everyone left. Just to show some of you who tent. This area is across from our site above. A nice section for tents only. And they all have this view. 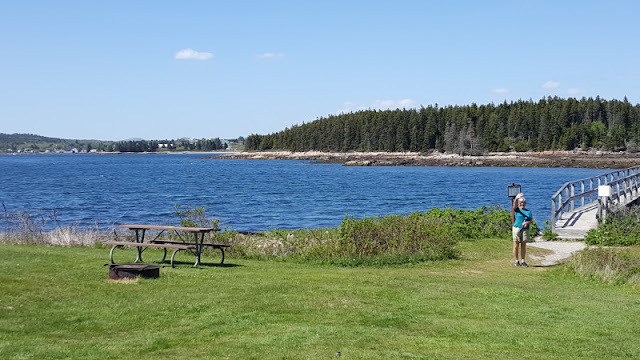 From our new campground, it is only about 3 miles to the Hulls Cove Visitors Center. From there we can access a wonderful bike ride on a number of connecting carriage roads---good , wide , hard packed roads with no vehicles--just hikers and bikers. At Witch Hole Pond there are quite a few beaver lodges. 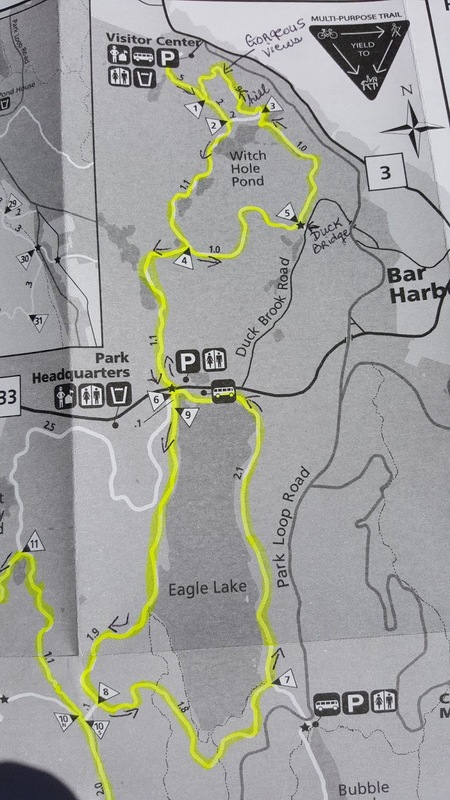 This is a section of the Carriage Road map with our ride highlighted. We started from the top at Hulls Cove. The ride included Witch Hole, Eagle Lake, and some "gorgeous views" back at the top looking over Frenchman Bay. 13.7 miles-which is pretty good for us. Stopping at one of the beaver lodges. 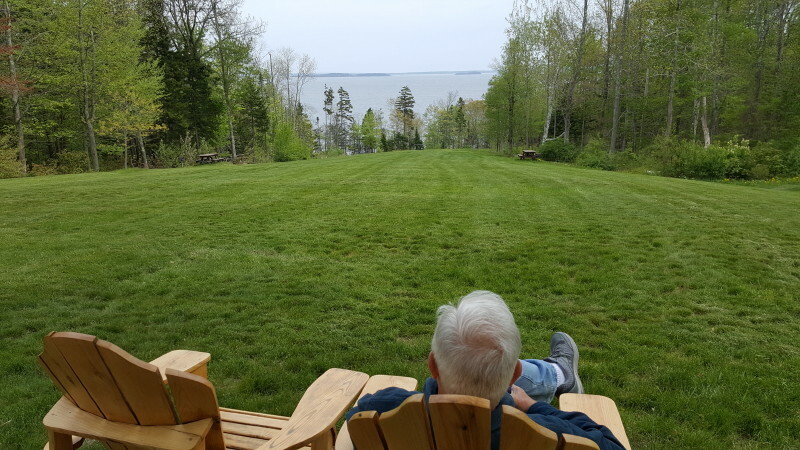 Looking out over Eagle Lake. More appreciated after some pretty steep hills---for us. Another view across the north part of Eagle Lake. 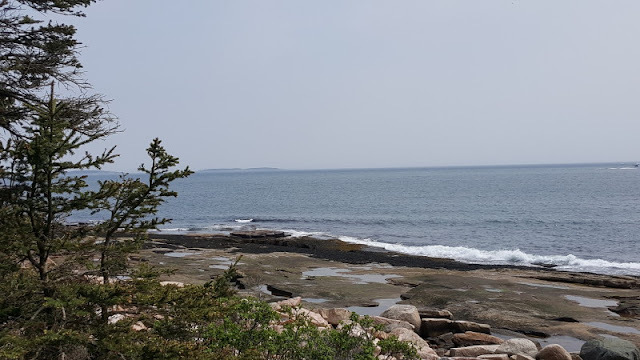 Jan and I were determined to see the Schoodic Peninsula on this trip. 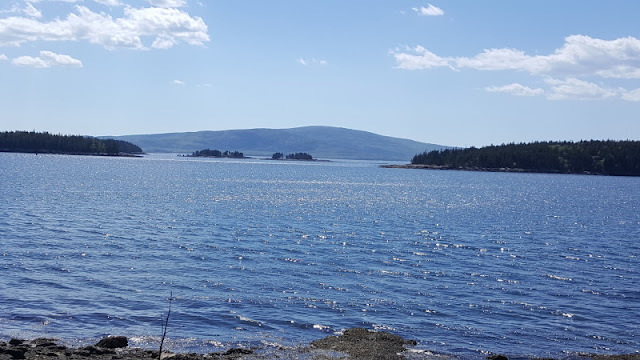 While only a few miles across the bay, the trip to the campground requires a 50 mile ride ---back to Ellsworth, north on Route 1, and then south on the peninsula. 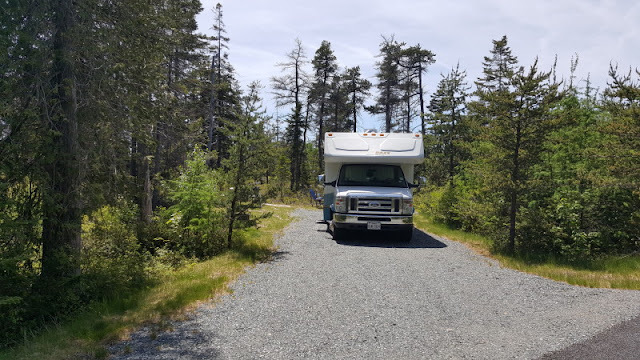 We didn't even know there was a national park campground here until a bike rider back in Scarborough told us. 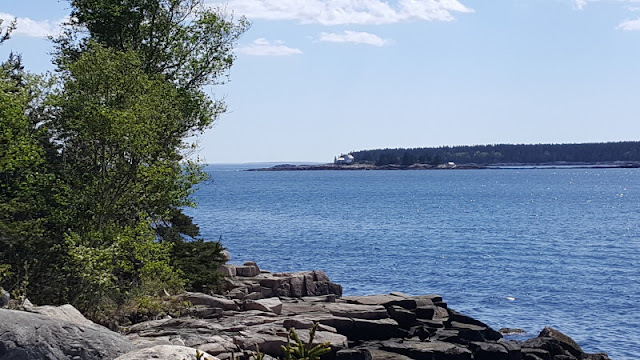 Schoodic Woods is only in its 3rd year. And the sites look much like ours above---GREAT!!! The story is--the Schoodic used to be Navy property for keeping track of ships at sea--1930's to about 1960. 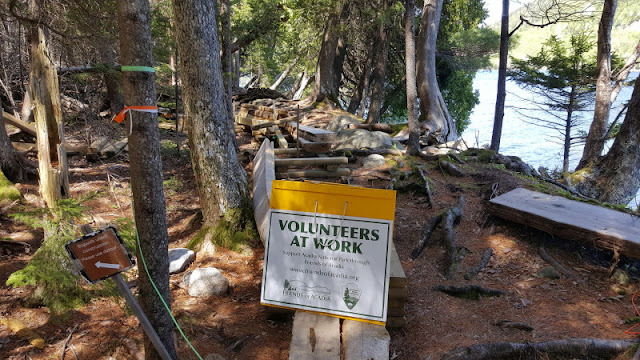 An anonymous donor spent about 40 million dollars to build this campground( probably why the sites are so well placed with separation), build the infrastructure, purchased all the equipment needed for maintenance and running, also including a fund for taxes-----then turned it over to the national park. Our first day includes an 11 mile bike ride around the park loop. This picture is from Frazier Point. 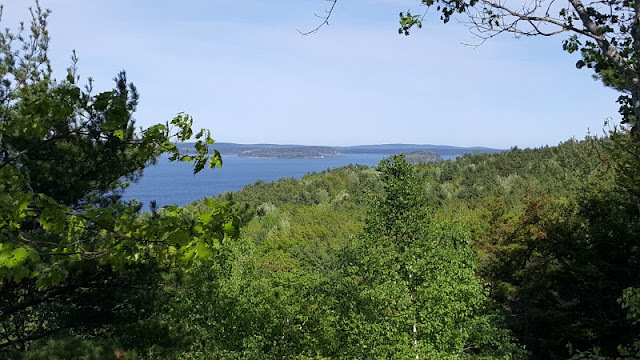 Lots of views west to islands and sometimes to Bar Harbor. 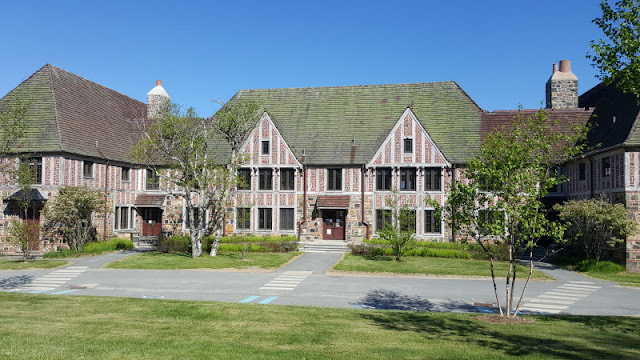 This building was built by the same architect as for the guard houses on Mount Desert. Right now it is used for offices and a museum for the Schoodic Education and Research Center. It was the building that housed the electronics for tracking ships at sea. A view from Schoodic Point.